Freedom and Flourishing: How should we describe the current imbalances within western democracies? How should we describe the current imbalances within western democracies? Nicholas Eberstadt’s answer to this question is fairly clear from the title of his recently published book, ‘A Nation of Takers, America’s Entitlement Epidemic’. Eberstadt describes the growth of welfare payments in the US, the decline of stigma against accepting help from the government and the growth of dependence on entitlements. He establishes that about half of the US population now live in households receiving some government benefits and more than 30 percent now receive means-tested benefits. He suggests that, with the growing numbers living on disability benefits, ‘gaming and defrauding of the entitlement system have emerged as a mass phenomenon in modern America’. He also suggests that the ‘taker mentality’ has gravitated toward ‘taking from a pool of citizens who can offer no resistance to such schemes: the unborn descendants of today’s entitlement-seeking population’. The book also presents two dissenting views. William Galston argues that although many people have come to depend on entitlements to fund their living expenses, they have not become ‘dependent’ in the way that children are dependent on their parents. He suggests that much of the growth of welfare entitlements rests on ‘temporally extended interdependence’. One generation consents to helping to fund the retirement of their parents, with the expectation that the next generation will do the same for them. He acknowledges, however, that ‘something has gone awry’ when the current generation discharges its obligations by imposing heavier sacrifices on the next generation. He suggests that the moral issue is ‘generational selfishness’ rather than dependence. He agrees with Eberstadt that disability benefits are subject to serious abuse, but suggests that the willingness of people to take advantage of the system is not necessarily evidence of deep cultural change. 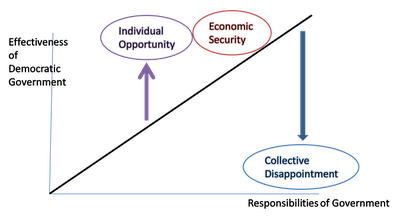 The main point made by Yuval Levin is that differences in vision about the relationship between government and the citizen – collectivism versus radical individualism – overlook the importance of the ‘space between the individual and the state’, which is occupied by the family, civil society and the private economy. He argues that the state gravely threatens the space for private life. He suggests that rather than dependence, the problem is more ‘a draining away’ of ‘civic energies by the effort required to sustain the liberal welfare state. The country ‘is increasingly exhausting itself’ not just because of the size of the entitlement and benefit regime but also because of its ‘immense inefficiency’. Levin suggests that rather than a nation of takers, America is ‘a nation at risk of becoming incapable of rising to the challenge of self-government’. The different viewpoints presented in this book are highly relevant to some issues discussed in the book I am writing. One of the points I am making is that when governments relieve us of the need to exercise our power of self-direction, then our skills in running our lives will not develop properly and we are likely to remain dependent on government throughout our lives. That means I am in sympathy with the points that Nicholas Eberstadt is making. At the same time, the US does not seem to me to be a particularly promising place to look for evidence of dependence on welfare having a widespread adverse impact on the social fabric. I also suggest in the book I am writing that there is a growing gap in many wealthy countries between the responsibilities that many people expect democratic governments to discharge and what governments are actually capable of delivering. Perhaps it could be described as a problem of dependence, in the sense of governments becoming addicted to ever more spending (despite rising debt levels or increased reliance on unstable revenue sources). At times, I have described the problem as an expectations gap, implying that it has arisen because of inflated public expectations of what governments can do. But it isn’t particularly helpful to blame ‘the public’. The underlying problem is that political leaders who seek to place responsibilities on government that are beyond its capability do not suffer appropriate political consequences. So, we should be thinking about how political leaders could be persuaded to moderate their promises and focus more effort on delivering efficient government. The diagram presented below seems to me to be a useful way to think of the issues involved. It is interesting to consider where particular countries should be located on the diagram. The countries of southern Europe should obviously be placed near the bottom right hand side and the Scandinavian countries would be at the top right. Hong Kong might be toward the left at the top. But where should we place the US, or Australia? In the old collectivism/individualism cultural tests, both Australia and the US were classified as individualistic, but Australia had a much higher collectivist element than the US. Now if we look at Government dependence we find that there has been an explosion in expectations that Government will fix things or control things, but that is a very middle class thing. The same argument holds for what might be called middle class welfare. If you remove both these things, you find that the proportion of the population dependent on welfare has increased. I would argue that that is due to structural change. You will also find, I think, that both the real availability of welfare and the value of welfare has declined as a consequence of rationing. Social housing is a classic example. So we have more people on welfare getting somewhat less in relative real terms, while those on the next rung up are arguably most disadvantaged, making it more difficult for people to move out of the welfare trap. I think you are right about the middle class, Jim. You might be right about structural change, but I would have thought macroeconomic downturns were more important. I suppose they are difficult to disentangle in their effects. The problem of dependence that is of most immediate concern is inter generational poverty. I think there is also reason for concern about longer term trends toward increased dependence on government. There is some evidence that this happened in Eastern European countries and has not yet been erased since the fall of communism.